The second most important thing to do is to avoid sugar and sugary foods. If you have reached your target weight, you may crave for rewards in the form of food. But celebrate your achievement by taking up the next big challenge, like preparing for a competition, instead of going back to your old habit of consuming unlimited amounts of sugar. Check your carb intake as carbs are also broken down into sugar in the body. The crunchy, sweet, and salty junk demon is everywhere in different forms. Fried chicken, chicken nuggets, fries, cookies, and sausages are processed and contain a high amount of sugar and salt. In fact, these foods balance the salt and sugar in such a ratio that your brain tells you to eat more of them. That is why people are spellbound by these cleverly created and marketed processed foods. But they are an absolute weight gainer. 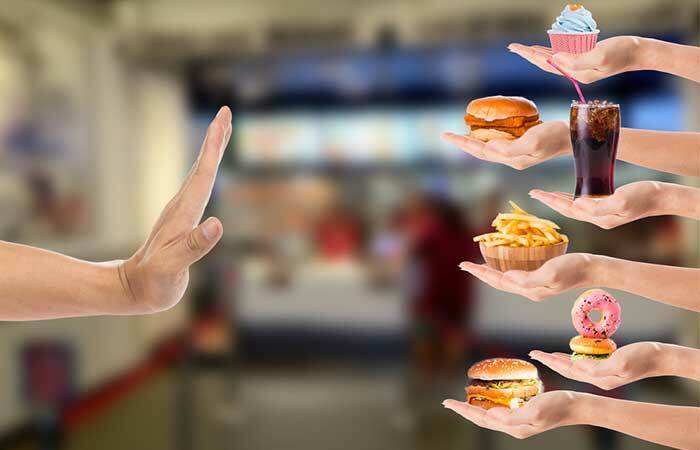 So, the next time you get drawn to processed food, remind yourself what it took for you to reach your current weight and if you are ready to go through the same ordeal again. Or best, keep processed foods out of your sight. Find out how, next.